It would be easier to locate the movie you want to watch in the Internet Archive, if the metadata about each movie was more complete and accurate. In the archiving community, a well known saying state that good metadata is a love letter to the future. The metadata in the Internet Archive could use a face lift for the future to love us back. Here is a proposal for a small improvement that would make the metadata more useful today. I've been unable to find any document describing the various standard fields available when uploading videos to the archive, so this proposal is based on my best quess and searching through several of the existing movies. I have a few use cases in mind. First of all, I would like to be able to count the number of distinct movies in the Internet Archive, without duplicates. I would further like to identify the IMDB title ID of the movies in the Internet Archive, to be able to look up a IMDB title ID and know if I can fetch the video from there and share it with my friends. Most of the cool movies that fail to show up in Butter do so because the 'year' field is missing. The 'year' field is populated by the year part from the 'date' field, and should be when the movie was released (date or year). Two such examples are Ben Hur from 1905 and Caminandes 2: Gran Dillama from 2013, where the year metadata field is missing. Should be 'movie' for movies. The title of the movie, without the publication year. The data or year the movie was released. This make the movie show up in Butter, as well as make it possible to know the age of the movie and is useful to figure out copyright status. The director of the movie. This make it easier to know if the correct movie is found in movie databases. The production company making the movie. Also useful for identifying the correct movie. Add a link to the IMDB title page, for example like this: <a href="http://www.imdb.com/title/tt0028496/">Movie in IMDB</a>. This make it easier to find duplicates and allow for counting of number of unique movies in the Archive. Other external references, like to TMDB, could be added like this too. I did consider proposing a Custom field for the IMDB title ID (for example 'imdb_title_url', 'imdb_code' or simply 'imdb', but suspect it will be easier to simply place it in the links free text field. The list is mostly generated using wikidata, which based on Wikipedia articles make it possible to link between IMDB and movies in the Internet Archive. But there are lots of movies without a Wikipedia article, and some movies where only a collection page exist (like for the Caminandes example above, where there are three movies but only one Wikidata entry). Legal to share more than 3000 movies listed on IMDB? A month ago, I blogged about my work to automatically check the copyright status of IMDB entries, and try to count the number of movies listed in IMDB that is legal to distribute on the Internet. I have continued to look for good data sources, and identified a few more. The code used to extract information from various data sources is available in a git repository, currently available from github. So far I have identified 3186 unique IMDB title IDs. To gain better understanding of the structure of the data set, I created a histogram of the year associated with each movie (typically release year). It is interesting to notice where the peaks and dips in the graph are located. I wonder why they are placed there. 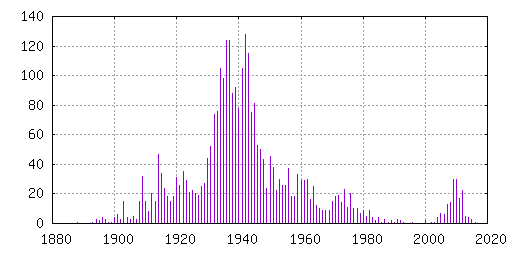 I suspect World War II caused the dip around 1940, but what caused the peak around 2010? The entries without IMDB title ID are candidates to increase the data set, but might equally well be duplicates of entries already listed with IMDB title ID in one of the other sources, or represent movies that lack a IMDB title ID. I've seen examples of all these situations when peeking at the entries without IMDB title ID. Based on these data sources, the lower bound for movies listed in IMDB that are legal to distribute on the Internet is between 3186 and 4713. It would be great for improving the accuracy of this measurement, if the various sources added IMDB title ID to their metadata. I have tried to reach the people behind the various sources to ask if they are interested in doing this, without any replies so far. Perhaps you can help me get in touch with the people behind VODO, Public Domain Torrents, Public Domain Movies and Public Domain Review to try to convince them to add more metadata to their movie entries? Another way you could help is by adding pages to Wikipedia about movies that are legal to distribute on the Internet. If such page exist and include a link to both IMDB and The Internet Archive, the script used to generate free-movies-archive-org-wikidata.json should pick up the mapping as soon as wikidata is updates. If you care about how fault tolerant your storage is, you might find these articles and papers interesting. They have formed how I think of when designing a storage system. USENIX FAST'07 Disk failures in the real world: what does an MTTF of 1,000,000 hours mean to you? by B. Schroeder and G. A. Gibson. Several of these research papers are based on data collected from hundred thousands or millions of disk, and their findings are eye opening. The short story is simply do not implicitly trust RAID or redundant storage systems. Details matter. And unfortunately there are few options on Linux addressing all the identified issues. Both ZFS and Btrfs are doing a fairly good job, but have legal and practical issues on their own. I wonder how cluster file systems like Ceph do in this regard. After all, there is an old saying, you know you have a distributed system when the crash of a computer you have never heard of stops you from getting any work done. The same holds true if fault tolerance do not work. Just remember, in the end, it do not matter how redundant, or how fault tolerant your storage is, if you do not continuously monitor its status to detect and replace failed disks.